The Kochs have exercised a lot of influence in Wisconsin, working with Governor Scott Walker to crush wages, bust unions, gut school spending, and promote vouchers. But the Kochs may have had their biggest victory of all handed to them last night by another billionaire couple. According OpenSecrets.org, outside groups and the three candidates spent an astonishing $36.9 million so far in the state’s most expensive primary in history. Much of this money was spent by billionaires Liz and Richard Uihlein, owners of the ULINE packaging firm based in Pleasant Prairie Wisconsin, in support of their hand-picked retainer Kevin Nicholson. Nicholson, deemed a “dream” candidate by Politico, is a decorated combat veteran with a photogenic family and impressive degrees from Harvard and Dartmouth. The only problem? His stint as the head of College Democrats of America. In contrast, Nicholson spent $3 million, and his billionaire benefactors the Uihleins spent more than $11 million via their Super PAC “Solutions for Wisconsin” and other groups, according to the Milwaukee Journal Sentinel. For the disciplined foot soldiers of the Wisconsin GOP, a Democrat turned Republican was a bridge too far, and it is somewhat astonishing that it took $11 million dollars for Uihlein to figure it out. It is almost unheard of for an established, experienced donor to spend that kind of money on an unproven commodity, but apparently the Uihleins thought that Vukmir was a terrible candidate to take on Baldwin. Although the Kochs’ Americans for Prosperity formally stayed out of the race, not endorsing either Vukmir or Nicholson in deference to the Uihleins, who have contributed to other Koch electoral efforts, the billionaire brothers’ presence was felt. Various Koch front groups, most importantly Concerned Veterans of America, spent millions on air pounding Baldwin. More was spent against Baldwin by Koch front groups than any other Senate candidate, according to Baldwin’s team. Vukmir herself has taken a leadership role in Koch world. She served on the American Legislative Exchange Council (ALEC) board of directors for years, serving as ALEC’s National Chair in 2016. She sponsored a dozen or so ALEC bills in Wisconsin, including bills to crush wages and advance vouchers. Her efforts advancing the ALEC agenda garnered her ALEC’s “Iron Lady” award in 2017. (Learn more at SourceWatch). Former Americans for Prosperity Chief Executive Officer Luke Hilgemann and Chief Operating Officer Sean Lansing were hired to run the Vukmir campaign, even after they spectacularly failed to elect Michael Screnock for the Wisconsin Supreme Court. Plus, Vukmir had the tacit backing of the Walker machine. Diane Hendricks, another Koch-network billionaire donor, was one of Vukmir’s biggest backers. She is the same billionaire who was caught on tape demanding that Walker pass ALEC’s “right-to-work” bill to create a red state in 2011, prompting Walker to explain his plan to “divide and conquer” Wisconsin workers. Although Walker formally did not endorse in the primary, his wife did, his son Alex worked for Vukmir, and kingmaker Michael Grebe, the long-time CEO of the Bradley Foundation and Walker’s campaign chairman, endorsed Vukmir, along with dark money man Eric O’Keefe. Uihlein’s hard-hitting ads and attacks by Breitbart News raised doubts about Vukmir that may linger. Early in the campaign, Vukmir interviewed for the endorsement of Steve Bannon’s Great America PAC, but was turned down. While both Nicholson and Vukmir ardently embraced Trump and the Trump agenda during the primary, Breitbart News was instrumental in undercutting Vukmir, surfacing a damaging video of her being critical of Trump and audio where she called calling his supporters “Trumpkins.” Breitbart gleefully pointed out the damage it did to her in the polls. Breitbart also called her out for driving a Toyota and for masking the Toyota logo in campaign commercials after she said in a fundraising appeal that she drove an American-made Ford. One of Uihlein’s final ads used the same video to attack Vukmir for her derisive comments about Trump. “He offends everyone; he offends women; he offends men; he offends little people; he offends fat people,” said Vukmir in March 2016. The ad, which can be seen here, concludes, “She sounds like Hillary. 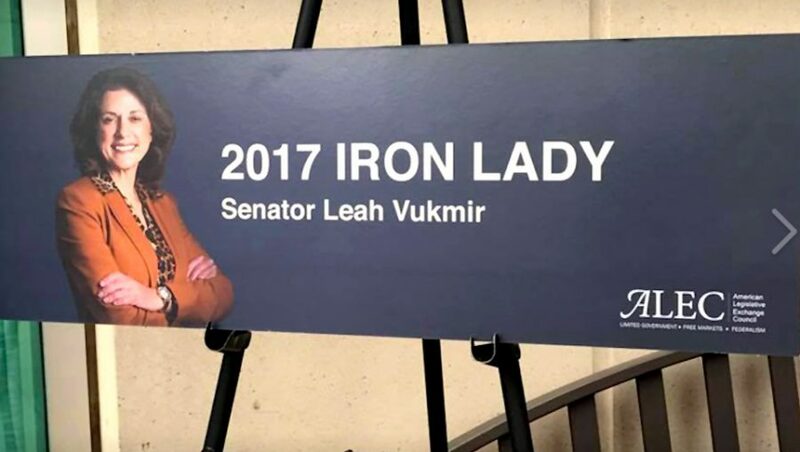 If you think you can expect Leah Vukmir to support President Trump, the joke’s on you.” Vukmir’s hypocrisy will be remembered by Trump fans in the state. Uihlein is one of Club for Growth‘s biggest backers, so it was no surprise that he used that national vehicle to go after Vukmir as well. Ironically, a recent Club for Growth ad featured a lawsuit brought by the Center for Media and Democracy (CMD) in 2013 when Vukmir refused to turn over public records related to the bills she agreed to author for lobbyists at ALEC. Vukmir was the Treasurer of ALEC at the time. After Senator Vukmir’s staffers made headlines by chasing a process server and pushing him to the ground, Vukmir not only denied having any materials related to CMD’s open records request, she garnered the support of the Republican Attorney General and put forward the argument that she was not subject to the Wisconsin open records law while the legislature was in session. If she had succeeded with this unprecedented claim, she would have gutted Wisconsin’s exceptional open records law, treasured by both Democrats and Republicans. CMD prevailed in its lawsuit, obtaining hundreds of pages of responsive emails and documents withheld by Vukmir, available here. The previously undisclosed records from ALEC’s Spring 2013 meeting show a Florida-based lobbying group instructing Vukmir and others to introduce a “model” resolution to thwart Medicaid expansion in their states. Vukmir is a former nurse. The lobbyist even wrote an entire ‘script’ for legislators to parrot–contradicting claims by ALEC that the organization was “legislator driven” and only legislators propose model policy. The judge threw the book at Vukmir, applying an unprecedented fine of $2,500 in punitive damages. The suit overall cost taxpayers $15,000. The Uihleins appear worried about Vukmir’s ability to tackle Baldwin, who is best known for her advocacy for health care for all and her long-standing opposition to free trade deals. Vukmir, in contrast, has backed every ALEC measure to lower wages in the state and block the expansion of health care coverage nationally, and has failed to take a stand against Trump as he calls for a boycott of Harley Davidson as it battles the effects of Trump’s tariff wars. No wonder Vukmir was dubbed “Nurse Ratched” by her Republican colleagues, after the cold, heartless fictional character made famous in the film One Flew Over the Cuckoo’s Nest. “The contrast between the Baldwin and Vukmir, when we are talking about women coming out to vote in record numbers this year, couldn’t be clearer,” said Madison attorney Lester Pines. Since winning election in 2012, Baldwin has raised $23 million for her 2018 reelection bid, far more than her GOP rivals. Her biggest givers are retirees, women, and University of Wisconsin employees. She will also garner big money support from Emily’s List, the League of Conservation Voters, and other Democratic groups. Now, however, Vukmir will have the full support of the Kochs’ Americans for Prosperity group and their many resources in the state. AFP wasted no time in pushing out an enthusiastic endorsement on election night and an unprecedented ad barrage will no doubt soon follow. The author has contributed to Baldwin and other Democratic candidates over the years.